A SpaceX Dragon cargo capsule is seen at the end of the International Space Station's robotic arm, with the bright Earth in the background, in this view from a station camera on March 26, 2013 during undocking activities. A private SpaceX cargo capsule undocked from the International Space Station early Tuesday to begin the trip back to Earth after three weeks linked to the orbiting laboratory. 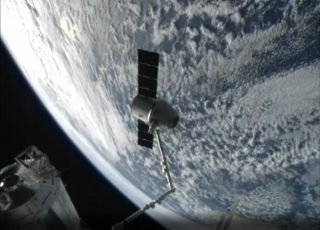 The unmanned Dragon space capsule was released from the space station today (March 26) at 6:56 a.m. EDT (1056 GMT), and is expected to splash down in the Pacific Ocean, about 214 miles (344 kilometers) off the coast of Baja California, at 12:34 p.m. EST (1634 GMT). The Dragon capsule is expected to fire its thrusters at 11:42 a.m. EDT (1542 GMT) to leave orbit. "Sad to see the Dragon go," NASA astronaut Tom Marshburn said from inside the station. "She performed her job beautifully, now heading back to her lair." Dragon is returning to Earth with about 2,670 pounds (1,210 kg) of cargo, including a set of LEGO toys that have been on the station for the last two years. The equipment will be returned to NASA as soon as recovery teams return the Dragon capsule to dry land. Once Dragon splashes down it will mark the end of Hawthorne, Calif., based private spaceflight firm SpaceX's second complete cargo mission to the International Space Station commissioned by NASA. The space agency contracted the spaceflight company to make 12 trips to the space station for $1.6 billion. SpaceX launched its first Dragon cargo mission to the station in October 2012 following a successful demonstration flight in May of that year. The company was founded in 2002 by billionaire entrepreneur Elon Musk to develop low-cost rockets and spacecraft. SpaceX is one of two private spaceflight companies with a NASA contract for unmanned cargo delivery missions to the International Space Station. The Virginia-based Orbital Sciences Corp. signed on with the space agency to make eight unmanned flights with its Antares rocket and Cygnus capsule in a deal for $1.9 billion. The Antares rocket's first test flight is scheduled for mid-April.